Balloon lights are a hot trend for cool parties, no doubt about it. But there are so many types and brands that it's difficult to know which ones to choose. We've done the research for you. Can you blow the balloons up with your mouth, or do you need an electrical inflator? Will they float when inflated with helium? There are two basic types of lighted balloons. On one hand, you have the ready-made bundles, where the LED light is attached to the inside of the balloon. Popular brands for this type of illuminated balloons are Lumi-Loons and iLLooms. 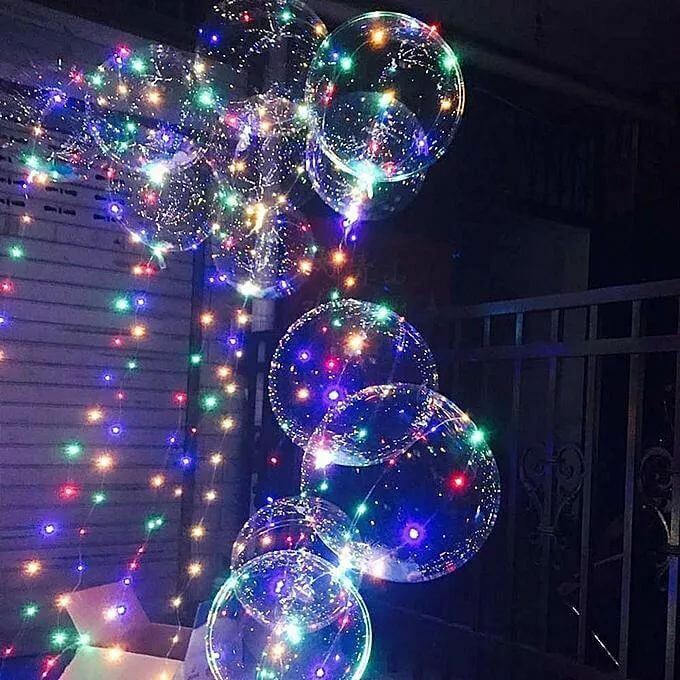 On the other hand, you can purchase light-weight, battery operated LED lights separately, and put them into or around the latex balloons yourself. We'll look into pros and cons for each type of balloon lights, how much they cost and where you can get them at a good price. These balloons have the LED light attached inside, at the end opposite to the balloon neck. You activate the light by pulling on the paper tab that's protruding from the balloon's mouth. The LED lights last for up to 15 hours, although some users say they glowed much longer. Just be aware that these lights are small and therefor not very bright. You'll get the best effect if you use them at night or in a darkened room. You can inflate them either with air, using your mouth or a balloon pump, or with helium. Be careful not to over-inflate them, or they may pop. The packs come with a measuring band to help you blow them up to the correct size. Because the battery / light bundle is attached to the inside of the balloon, opposite of its neck, the inflated balloon tends to orient with the mouth upwards. So, when you inflate them with helium, they won't float straight upside, as a regular balloon would do, but sway sideways. The LEDs may need some squeezing or tapping to get them turned on. A mixed color party pack of 15 iLLooms sells for between $10 and $20 at Amazon. Similar no-name LED balloon bundles received good reviews too, and are a bit cheaper. You can get 20 balloons for under $15. The iLLoom review video below shows how to use the balloon lights and how they look when inflated with air or helium. Lumi-Loons come as complete units containing a latex balloon, three LED lights and a special valve with a 6-foot string attached to it. The bulb area of the light is inserted into the latex balloon and the balloon is inflated around the light. Because of the special valve, which seals the balloon tightly to keep the air or helium from leaking out, you cannot blow up Lumi-Loons with your mouth. You'll either need a helium tank (if you want the balloons to float) or an electrical balloon inflator. Supposedly you can also use a bicycle or car tire pump to inflate them, but I couldn't find any confirmation that this really works. You activate the light by pushing a button through the balloon, either before or after inflation. You can choose between three modes: always on, slow blink or fast blink. If fully inflated, a helium filled Lumi-Loon will float and blink for about 8 hours. Contrary to the iLLooms, the LED unit sits at the mouth of the balloon, so they will float up right, and not sway sideways or upside down. 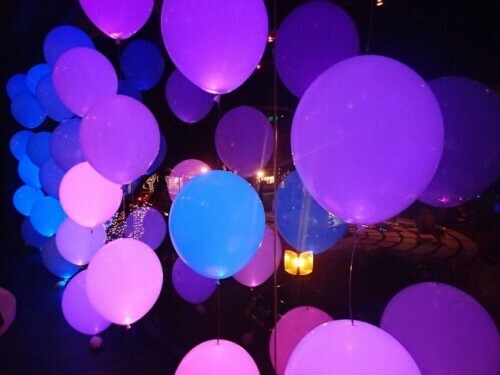 You can choose between white balloons with different colors of LEDs, colored balloons with white lights, or a variety of patterns for different occasions. Packages of 10 Lumi-Loons sell for about $15 at Amazon, but at the time of writing (January 2019), I could only find two listings. Looks like the Lumi-Loons aren't being produced anymore. Watch the video below for a demonstration of how they work. These are small, light-weight, battery operated LED lights that you turn on and then put inside your latex balloon. They come in white, red, green, blue and purple colors, and last for 8+ hours. They are not only used for balloons, but also in paper lanterns, floral arrangements, and other settings. A package of 24 white or colored LED lights costs between $6 and $10. A variation of these LED lights often used by balloon decorators are the so-called Party Dots. They look like mini tea lights. You can peel off the seal from their bottom and stick them to the outside of balloons (or any other dry surface). Or you put them inside the balloons, like the regular LED lights. They look really nice, as you can see in the video below, but are rather expensive. A 5-er pack of Party Dots sells for about $10. Not sure where the name "bobo" comes from, but these lighted balloons sure look gorgeous! The colorful light-up "BoBo" balloons spruce up your party, dance event or any other occasion worth celebrating [Image source: yaoota.com]. The transparent balloons are made of PVC, not latex. They blow up to 18 inches. You can inflate them with helium, an electrical air inflator or a hand pump. Don't try blowing them up with your mouth though! Super important: stretch the balloons several times in all directions before inflating them. Otherwise you won't get them to 18 inches in size. The LED balloon lights come as 3 m long copper wires which you wrap around the balloon after inflating and tying it. You need two AA batteries for each string of lights (often not included in the package). You can get 5 units containing the balloons and LED string lights (without the batteries) for about $13 to $15 at Amazon.